My first post as Taylored Expressions creative team. Today is the release day! It is here finally. All the new products which you have seen over at TE Blog over the past three days are here for you purchase and enjoy! Today I have a Father’s Day card using the new Argyle Cutting Plate and My Favorite Dad stamp set. I have colour washed a panel of watercolour paper with Cracked Pistachio distress ink and then layered with more of the same colour. Once dry, I die cut using the Argyle Cutting plate. I then spattered the die cut with gold colourshine spray. For the sentiment, I stamped the sentiment from My Favorite Dad stamp set in black ink then clear heat embossed on white piece of cardstock. I then framed the sentiment panel with the smallest frame from Frame to Frame die in gold foil cardstock. I foam adhered this to the colour washed argyle die cut panel with bunched up thread under the sentiment panel for added dimension. Finally adhered this Argyle diecut panel to the white card base again using foam adhesive. I love dimension on my card. You can tell by now lol! Finally added some black Doodlebug sparkly enamel dots and gold heart shape enamel dots form My Mind’s Eye Fancy That collection. Taylored Expression Store is now open with all the new goodies. Wonderful card, Gayatri! 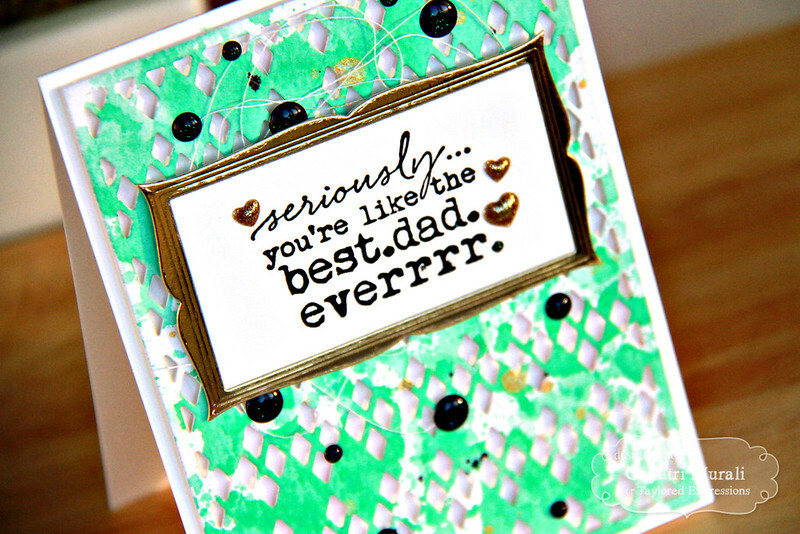 I love how you used the cutting plate – what a fun background!! This looks awesome with that gorgeous background and the framed sentiment…beautifully done!!! Welcome to TE!!! Love the colours and the awesome background you have created !